Photos originally published on Jan. 19, 2010. Do you remember when the Pacific Ocean became OB’s front yard? 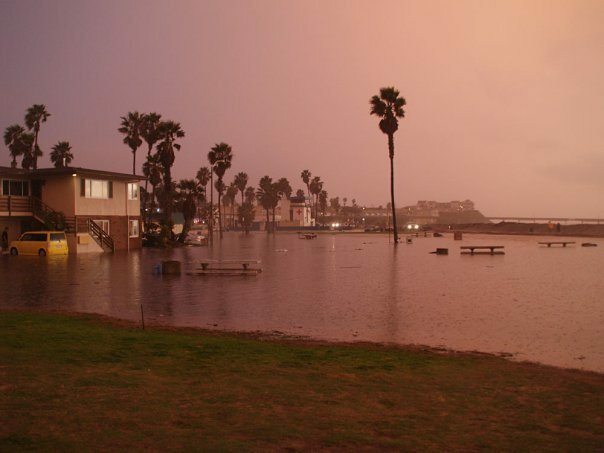 The last time it really flooded in Ocean Beach was in mid January 2010. The rains and high winds brought the ocean right into Ocean Beach’s front yard those several days. The typical areas of OB did flood. And then there was the aftermath. Check these photos out – sent to us by Pat James, Steven Kendrick, Seth Connolly, Jim Grant, Logan Marcus, and Doug Porter. Needless to say, guess what would have happened to the underground garage that the developer wanted to put in under his 12 condos at the corner of Saratoga and Abbott. Probably a good thing to sell the apartments and get out. Eh, Allison? Eh, LisaOB? if they dig the garage deep enough, it could solve all flooding issues in OB. I’m glad you got shots from the other side. it was getting dark and the water had subsided quite a bit. The photo gallery has been updated with pics from the aftermath. For the last two years, I lived at 1984 Abbott, which is the front left studio apartment on the corner of Abbott and Saratoga. I moved on January 1st to Coronado Avenue. I called my (ex) neighbors, and they said my old place had about 4 inches of water (as did the other front ones), whereas the one-story, one-bedroom apartments facing the beach/park (on the same property) had over a foot of water in them. They had to stay at the OB Hotel for the night, and are cleaning things up right now as we speak. I’m going to check in on them later today, because when I went there yesterday night at 6 pm, I could barely drive my Bronco through Abbott–and there was no way I was going to turn onto Saratoga, because the water there was likely two feet deep. When I first saw the plans for the underground parking garage, I laughed so hard thinking about how it would take ten minutes to flood. If you look at the plans, however, it says they were going to install a de-flooding system so to prevent this from happening. Sure, and pigs fly! Pat, Seth & Steven- thanks for making it REAL. Well, at least all the fire pits were cleaned … by nature. More pics have been added as of 5 pm Tuesday. Quick, if you are west of SS Cliffs, follow the Tsunami signs to safety!!! Is that firepit #9 I see in Pat’s pic? Years ago I lived at corner of Longbranch/Spray. Moved to Ohio — darn! Have been watching web cam of the pier at http://www.oceanbeachsandiego.com/ocean-beach-mainstreet-association — for old time’s sake. These pics are amazing! There was a water mark on my downstairs walls about 8″ high from a previous flood. Will be many new marks after this flood. I don’t know anything about digging a parking garage, but from the comments, sounds like a really dumb idea. Editordude thought it would be neat if OBceans were reminded that yes, it does flood in OB every now and then. And look where it floods and think what is being built there now. Flooding during a drought, you laugh. Ah, but experts are expecting an El Nino this rainy season. Anyhow, just dreaming of rain …. Historically everyone’s memories of flooding depends upon how much it affected them. As well many of these events have diverse causes. Some of the worst were due to combinations of factors like heavy rainfall, high storm surge and the city failing to do maintenance on the palm trees which allows drains to be clogged with what blows off them. The removal of the center jetty by the Army Corps some years back was supposed to eliminate the worst case scenario of a river hitting high tides and overflowing into OB as had happened before. The El Nino of 1982 (I believe) was so bad that the OB Pier was damaged, its parking lot so damaged it had to be completely repaired, flooding in northwest OB very bad – I remember standing in the middle of the intersection at Abbott and Muir almost up to my waste in water. A girl I used to date who lived near Voltaire and WPL at the time showed me pics from that winter with people rowing small boats and paddling kayaks in front of the big 3 story condo building on the corner. The water was at the top of the windows on the shorter cars you saw parked so this is consistent with your recollections. There is a depression in the elevation around long branch and brighton east of abbott I imagine one could have drowned at home there. IIRC the cause of those floods were the remnants of hurricane ewa which hit hawaii directly. I was onboard the USS Coral Sea riding that out off the coast of Oahu when our port visit was delayed. Looks like Pat’s wife Susan walking towards the ocean in his first photo. I also remember the ’82 flooding. Until then had never really studied the small variances in OB’s topography. North OB is really susceptible, especially the intersection you mention, Frank. I remember the alley behind me on Long Branch was so deep, that I saw someone surfing down it!! No lie! The apartment bldg I was living at the time flooded the ground floor twice in 48 hours as we had two flash floods. I was grateful to be on the 2nd floor!